2017 Communication + Place papers have been published and are available for review. Every year, SEGD holds a call for papers to gather the new thinking about practice and education. Selected papers are presented at the Academic Summit at the SEGD Conference and published in Communication + Place. Communication + Place is the official research journal of the Experiential Graphic Design community. Published online, the journal features articles from both academics and professionals advancing the XGD profession through creative research, curriculum development, project reviews and user-centric testing. 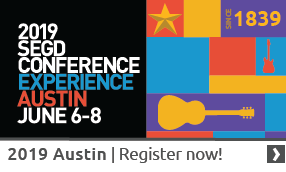 The 2018 SEGD Academic Summit call for papers and criteria is now online and open for submissions. All abstract submissions must be received by March 2, 2018 to be peer-reviewed for potential selection for the summit and publishing in Communication + Place. View all papers, including previous years’, on the Communication + Place home page.